Please volunteer to lead a group! Go HERE to sign up! Check out our walking school bus routes HERE. Meet the walking school bus at the closest intersection to your house at the posted time (between 6:53am and 7:00am depending on your location). 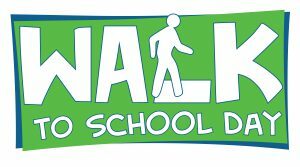 All walking school buses will meet on the north side of the school along Raleigh Drive at approximately 7:20am. Safety: All walking school buses will be led by Rosemeade parents holding school bus signs. We also ask that parents walk with your students, if possible, and bring a flashlight as the sun may not be up at the start of the walk. so you may want to arrive at your “bus stop” a few minutes early. Our students and families will be greeted by energetic music. A healthy snack and water will be provided by upon arrival on the north side of the school. We will take a group picture then send the students on to class at around 7:30am. Families are welcome to stay for the photo! NOTE: A makeup date will be posted if bad weather occurs the morning of October 10th.